I used to collect pencils when I was little. 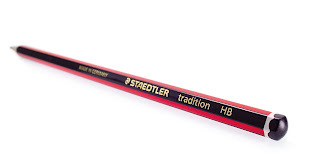 Everywhere I went, I collected decorated HB pencils. My parents continually bought me whole sets of stationary after a new Disney movie had come out just so that I could get the one or two pencils included with the themed ruler, eraser and pencil bag. This particular collecting-mania stopped around the age of eleven (end of grade five/beginning of grade six), the fateful age where my dolls were packed away because I considered myself a 'big girl' now. So, too, the pencil collection met the same fate and was packed away into some dark recess of my childhood bedroom cupboard. At around the age of twenty, I found my collection of around 80 or so pencils during a cleaning spree and decided to donate them to my Mom, who at the time was teaching life-skills classes at underprivileged schools where kids couldn't even afford a pencil. Out went the pencils without a second thought. Reading Miss M's post, I thought back with nostalgia to my quirky pencil collection...the Tiggers and Poohs, the hedgehogs and horses, the Mickeys and Donalds and Pocahontases. I thought about how often over the years I had purged items from my past to various charities, only to think back about it with a twinge of regret; while at the same time knowing that in the moment, it was the best decision to get rid of the extraneous "stuff" in order to feel lighter. I like to think those pencils went to good homes. That they were sharpened and chewed and dropped and broken and used down to little stubby stumps of lead, instead of just being kept in a childhood cupboard. But most of all, I like to think back to the fact that each one had a story attached from my childhood without the new owner even knowing it. And even though I may not have the pencils now that I need them, I do have the memories of how I came to own each one, and that's enough.